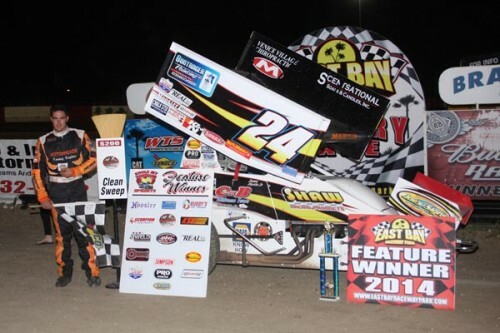 Tampa, FL – Four divisions were on hand as the Eagle Jet Top Gun Sprints, Gagel’s Open Wheel Modifieds, V8 Warriors and the Motorstats.com 4 Cylinder Bombers were here at East Bay Raceway Park. First feature of the night belonged to the V8 Warriors with Roy Woodhouse and Jimmy Baker winning their heats and also made up the front row for the feature. When the green waved it was Woodhouse quickly taking the lead on lap one but it was Bill Bill Smith bringing out the first caution spinning in turn two. Several more cautions came out early in the feature with Woodhouse still leading over Baker until lap nine when Baker took over the top spot. Caution would come out with just four laps remaining with a single file restart as Baker was leading over Brett Phillips and Bo Anderson. The final four laps belonged to Baker as he went on to win his first feature in the V8 Warrior division for the year. Rounding out the top five were Mike Wilson, Bo Anderson, Roy Woodhouse and Brett Phillips. Next up were the Gagel’s Open Wheel Modifieds. Winning their heats were Travis Varnadore and Austin Sanders. For the feature it was Steve Miller and Buzzie Reutimann on the front row. When the green waved Reutimann led the way until Roger Crouse trying for a position spun in turn four bringing out only one of two cautions for the feature. Reutimann went onto to winning his second feature of the season in just five starts. Reutimann said in Victory Lane he was on the phone with his son David talking about the adjustments that had to be made for the feature as the chassis is a Beak Built Chassis by David Reutimann. Rounding out the top five were Austin Sanders, Steve Miller, Matt Miller and Travis Varnadore. Eagle Jet Top Gun Sprints were next for their 25 Lap Feature Event with Danny “The Hammer” Martin, Jr., David Slawiak and Shane Kreidler winning their heats and were eligible for an extra $200 courtesy of the Jeff Barfield Memorial Clean Sweep Award if they also won the feature. It would be Danny Martin, Jr. and current points leader of the series Mark Ruel, Jr. on the front row for the feature. Before the feature began the drivers did their four wide salute to the fans thanking them for coming out to watch. When the green waved it would be Martin, Jr. leading with Ruel, Jr. right on his back bumper. First caution of the race came on lap four as two cars tangled in turn one. On the restart it was still Martin, Jr. leading with Ruel, Jr., AJ Maddox the top three. Martin continued to lead the way when he started to come up on lap traffic by lap eight. Another caution came out as heat winner Slawiak spun in turn two on lap ten. On the restart Martin, Jr. still had Ruel, Jr. behind him along with Maddox, Shane Kriedler and Johnny Gilbertson. Third place AJ Maddox took a hard left to the infield in turn two ending his night with a sixteenth place finish. Green waved again until D.J. Peeples brought out the red hitting the back stretch wall and going for a slight tumble. Peeples was ok and the car had some minor damage but was not able to finish the feature. The final restart on lap thirteen it was Martin leading making his way once again thru lapped traffic and going on to win the feature. “I would like to thank Shaw Racing for allowing to be behind the wheel as Shaw works on the car all week” Martin stated in Victory Lane. He also thanked the fans at East Bay for coming out and supporting them and East Bay Raceway Park for having the Eagle Jet Top Gun Sprints. Martin, Jr. is the defending Champion of the series. Rounding out the top five were Mark Ruel, Jr., Matt Kurtz, Shane Kreidler and Johnny Gilbertson. Final feature of the night belonged to the Motorstats.com 4 Cylinder Bombers. Winning their heats were George Handy and Eddie Summitt and the two also made up the front row for the feature. Handy quickly took over the top spot with Wayne Kissam and Stephen Morris to follow. The first caution came out as the first lap was scored as two cars tangled in turn four. Handy quickly took the lead again with Kissam to follow only to fall back to third as Patrick Fiore, Sr. took over second on lap five. The only other caution came out on lap eleven for debris as Handy went on to win his third feature of the season. Rounding out the top five were Patrick Fiore, Sr., Wayne Kissam, Richard Humfeld and Kayla Jones. Racing continues next weekend as the Late Models, Limited Late Models, Q Auto & Injury Attorneys Street Stocks, Outlaw Fours, Motorstats.com 4 Cylinder Bombers and the Florida Old Time Modifieds will be in action. For further information, log on to www.eastbayracewaypark.com for call 813-677-7223 for more information. 12. 7M Roberto Morfin, Sr.
1. 24 Danny Martin, Jr.
2. 83 Mark Ruel, Jr.
2. 88 Patrick Fiore, Sr.